27.06.14Gold Tudor Gown Check out our stand out Gold Tudor Gown! 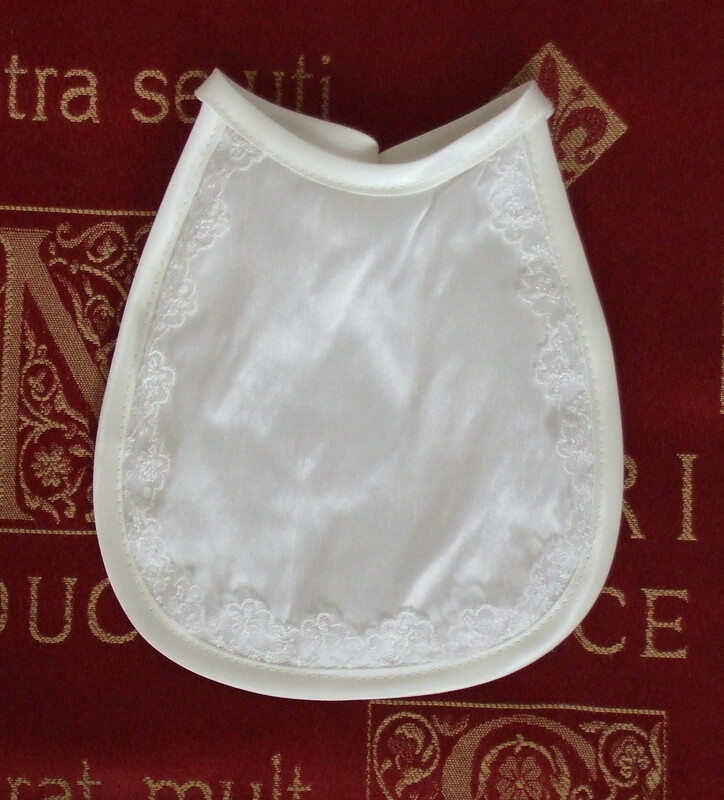 A small sized silk bib with a pretty lace trim to match or compliment many of our gowns and dresses. Available in white or ivory. 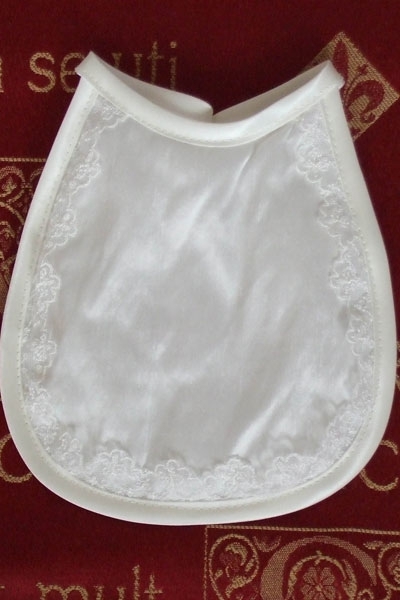 This can be personalised with baby's name and date of Christening at extra cost (see Embroidery). We specialise in quality christening gowns and baptism wear, made in England and have further enhanced our offering with the addition of our bespoke service. We provide a wide range of Baptism Wear and Outfits for your baby's special day. Our range includes: christening gowns, dresses, outfits, baby gown, shoes and accessories. Cookies are small text files that can be placed on your computer by websites you visit, which are used widely to make websites work properly or more efficiently, as well as to provide information to the owners of the site, and/or their service providers. Most browser software will allow you to turn off cookies, but you should note that doing so may cause some website functionality to stop working. Check your browser's help or privacy settings if you want to turn cookies off. Cookies for Website Traffic Monitoring and Improvements 1. Google Analytics creates 4 cookies, __utma,__utmb,__utmc and __utmz. We use Google Analytics to monitor our website's performance, and how visitors use it so we can make improvements to the user experience. If we use Google Adwords or Google A/B testing, these may also utilise a cookie for the same purposes as Analytics. Cookies for User Convenience 2. We use a simple cookie to help remember login details for our site's admin panel and also for our Blog admin panel. These are for user convenience only, and no information is collected or shared with anyone. Essential Cookies for Website Functionality 3. PHPSESSION. This is an essential cookie that assigns a session to each visit to ensure the site's functionality works properly, that only lasts while you are on this site. No information is retained or shared with anyone. 4. regID. An essential cookie which helps the website remember you after you have logged in, allowing you to utilise specific website functionality for logged in users only. No information is retained or shared with anyone.